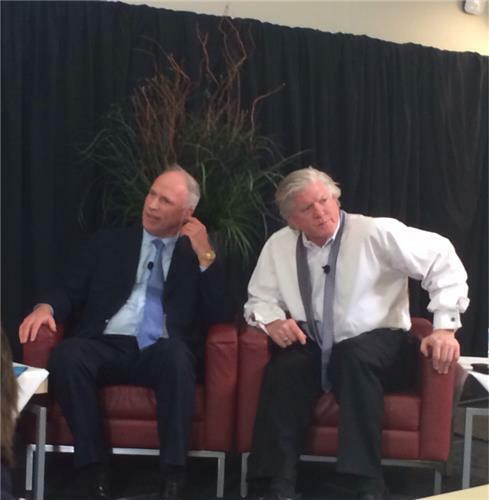 Brian Burke and Don Meehan discuss issues with law, commerce and politics in the sports field at the third annual speaker series, “Law, Business, Politics: The Real World”, hosted by the Ted Rogers School of Management Department of Law and Business. 58-year-old #BrianBurke is the acting president and general manager for the NHL's Calgary Flames. 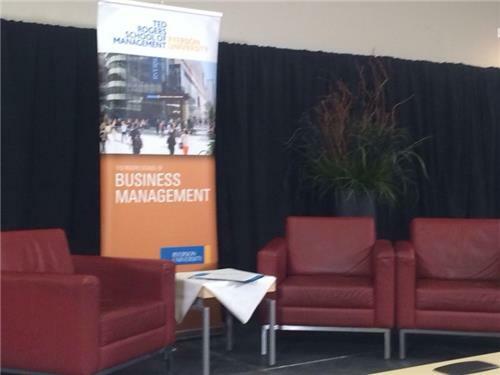 "We've got real superstars," says Ralph E. Lean, Ryerson Distinguished Counsel in Residence. Don Meehan started his own business from the ground up by getting funding the one way possible: "begging the bank"
Fun fact: Brian Burke is a Harvard educated lawyer. "You don't have to have your life planned out!" Brian Burke has his dress shirt monogrammed with his initials but prefers the untied tie look. "For the women in this group, the talent side (of professional sports) is where the women have yet to make an impact …. and there's no reason for that," says Burke. 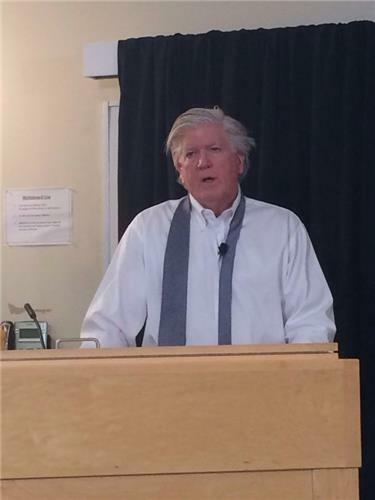 Brian Burke to student: "I thought I had a lot of hair, it looks like you have one of those Russian caps on." Don Meehan won't comment much about a Tod Bertuzzi question if he would legally advise him. "No one will comment on a case that is this imminent, " says Burke. "This is a full contact sport" says Burke speaking about concussions in hockey. "Most of us chose to play hockey because it's a full contact sport."